Gotta love Cumberland Brews; it’s a warm, cozy place with solid beers and great food. And sometimes you can also get a really good deal. Take Thursdays, for instance. I stopped in yesterday for lunch upon hearing that Cumberland offers a Thursday special of steak and beer for 10 bucks. My immediate reaction was that it sounded too good to be true, and you know what they say about situations like that. But I’m here to tell you that the New York strip I had was the real deal: eight ounces, tender and tasty, and seasoned with black peppercorn. And it came with a pile of delicious hand-cut fries and even a miniature red velvet cupcake. Oh, and for the $10, you also get a pint of your choice. I mean, it’s darn near ridiculous. For the quality and amount of food I was served, I doubt I could have prepared that meal at home for the price. And that doesn’t even factor in the beer. Oh yes, the beer: My pint of choice (OK, I may have had three, sue me) was the L&N #152, a “steam beer” that is actually a lager, but drinks more like an ale. Presumably named after the Louisville railroad (for which my dad briefly worked back in the late 1960s), L&N #152 has a dark body and plenty of hops — OK, perhaps not enough for a hophead (it’s 40 IBU), but enough to provide a familiar bite and tingle sensation on the palate. That’s good enough for me in the right situation. It pours a deep amber with a creamy, tan head, and packs a nice malt body to go along with the hops. It reminded me slightly of one of my local favorites, Irish Rover Red, which as an ale that is more malty but with fewer hops. 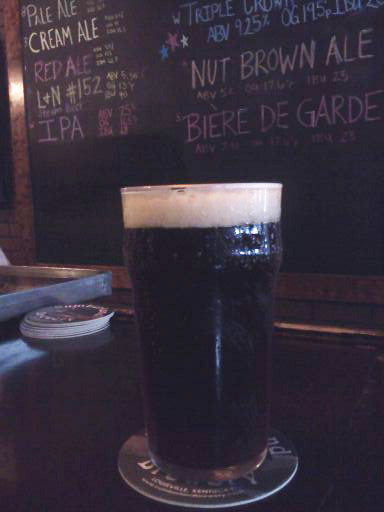 The L&N also has an almost dry sensation on the palate, which isn’t there in the Rover Red. If you haven’t tried it, I’d recommend it highly on a Thursday. Or a Wednesday. I’m told you can get a bison burger and a pint for $10 on hump day, which is a pretty sweet deal too.